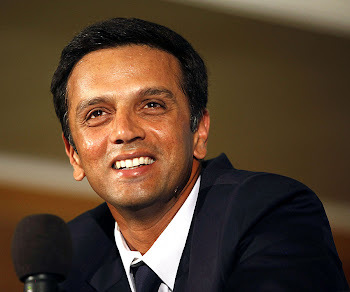 Top Asian cricketer Rahul Dravid has backed a scheme to encourage more Indian students to study in Scotland. The Rahul Dravid scholarships will allow 10 Indian students to study at Adam Smith College in Kirkcaldy, Fife, by offering help towards tuition fees. The college said the scholarships were the first of their kind in the UK and were designed to remove some of the barriers to international education. They are worth about £1,000. Students will be selected on academic merit. The scholarships are supported by Prime Minister Gordon Brown, who facilitated the original approach to Dravid on behalf of the college. He is the captain of the Indian cricket team and one of the country's most high-profile sportsmen. Dravid said: "I was invited by Gordon Brown to consider supporting a scholarship scheme, which is something I considered very carefully. "It is important to me that young people aspire to be the very best they can be, that is why I am backing them to reach their true potential with scholarships." Studying at a western institution is a popular option for many young Indians, for whom places at colleges and universities at home are limited. Mark Cullens, assistant principal, said: "Studying in Scotland fits really well with the quality of the Indian education system, where two years of full-time school education is followed by two years of further or higher education. "Students progress well and have the added advantage of gaining a two-year work visa to work in Scotland after their studies." Noble cause indeed. Interestingly there was nothing in Indian media about this. Had it been Dhoni or Yuvraj, I'm pretty sure they would have gone gaga over it. You said correctly.Rahul Dravid is such a gentleman that he himself never told anyone that he is backing these scholarships.